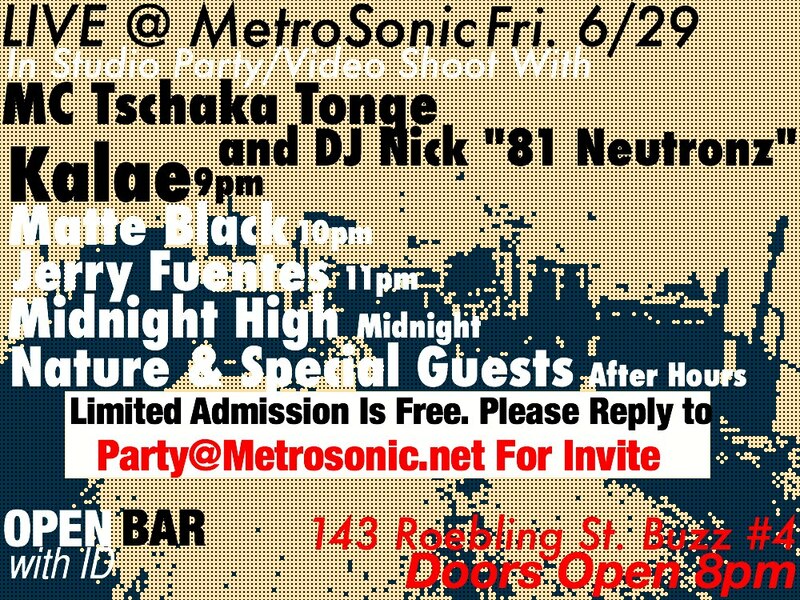 This is a live music event in MetroSonic Recording Studio in Brooklyn! The event includes performance from the NYC’s hottest DJs and musicians such as Kalae All Day, Matte Black, Jerry Fuentes, Midnight High, Nature, and more. Our film crew will be shooting the performances and behind the scenes, so we would love for you to come down and be a part of the event. Admission is FREE! Just email us at party@metrosonic.net, and we’ll send you an invitation! Refreshments are on us. Nature and special guest will be joining us too! Posted in Live Shows, Updates and tagged DJ Nick “81Neutronz” Low-Beer, Free show, Jerry Fuentes, live music, matte black, MC Tschaka Tonge, Nature.